It’s been two years since Rodrigo Duterte was elected into the highest executive position in national government. Looking back on his ascent to presidency, we remember his claim to fame as a champion of change; his gangster-like character and seemingly resolute stance on condemning criminals seemed like a breath of fresh air amid years of ineffective leadership and decades of corruption. In a country suffering from political fatigue, he seemed promising: here was a political figure who wasn’t afraid to call things out as it is—or so we thought. Upon beginning his term, Duterte imposed a three- to six-month deadline on his war against crime and corruption, even going as far as to give an ultimatum should he fail, saying, “If I succeed [in resolving crime and corruption] perhaps that would be my greatest contribution to the country, but if I fail, kill me.” A bloody six-months followed. It was one killing after the next, with gunshot corpses on the streets, and a plethora of drug users scared to their core handing themselves in to the police. To many of his supporters, this seemed like progress. 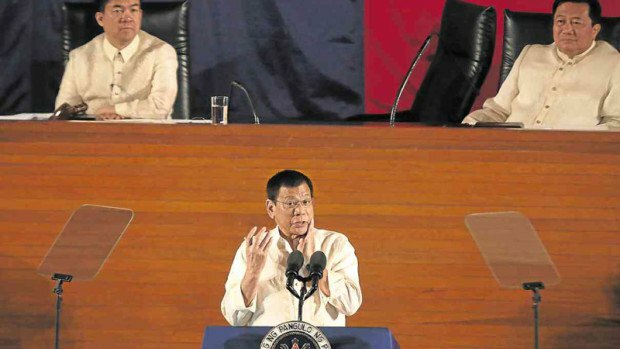 “We will not stop until the last drug lord, the last financier, and the last pusher have surrendered or put behind bars or below the ground, if they so wish,” said the president in the State of the Nation Address last 2016. If he’s so concerned about the country’s drug problem, why isn’t he targeting those at the helm of it? Well, the truth is Duterte never had any plans of targeting them. They’re not even here. The drug lords that Duterte is so vehemently set on punishing aren’t even in the country, yet he is waging the war here, in our country, and our countrymen are paying for it with their lives.